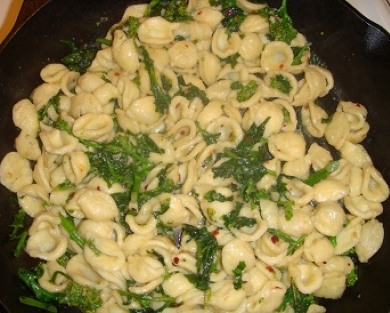 Rapini with orecchiette pasta, garlic and crushed red pepper! Every year we see more and more of our customers becoming devoted fans of this deliciously nutty and mildly bitter green. 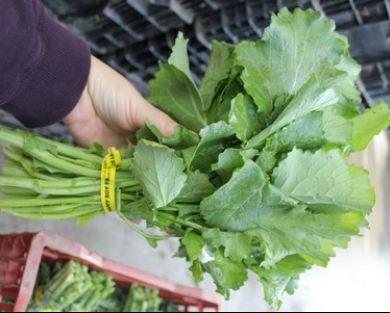 Don't let the name fool you as broccoli raab, or rapini as Italy refers to it, is actually more closely related to the turnip than broccoli. This similarity can be seen primarily in raab's hearty mustard-like greens and although broccoli-like florets develop, they never size up. This vegetable has long been popular in the parts of the world from which it hails, the Mediterranean and China, and one of it's slightly sweeter sister varieties is the most eaten vegetable in Hong Kong. With a flavor that's a little broccoli-y and a little mustard-y, it's no surprise that folks here are catching on quickly! Broccoli raab is a tasty change from our region's more typical greens (chard, kale, collards), and just as easy to prepare. Alone, it stands out in a simple and classic olive oil-garlic sauté -chili flakes if you please. Raab is also excellent stir-fried, braised, or steamed, and quickly blanching before proceeding with your recipe will help to smooth out the flavor and reduce any bitterness. Pasta dishes especially love this unique green. Keep dry and refrigerated, wash only before using as excess moisture causes faster deterioration. Broccoli raab is packed with vitamin K and high in folic acid. It is also an excellent source of vitamins A and C, as well as iron and calcium. Enjoy with pasta or as a side dish. Add to omlettes or scrambles. Try blanched on pizza, or the classic sauté with olive oil, crushed garlic and chili flakes.